Amber Stettnichs and two of her colleagues from NEAPCO attend the 2018 UNL STEM Career Fair at Pinnacle Bank Arena. Having an opportunity to meet with hundreds of employers is the benefit of being a student attending one of Nebraska’s annual spring career fairs but how does that experience transition to when the student is now the employer, recruiting engineering students on behalf of her company? 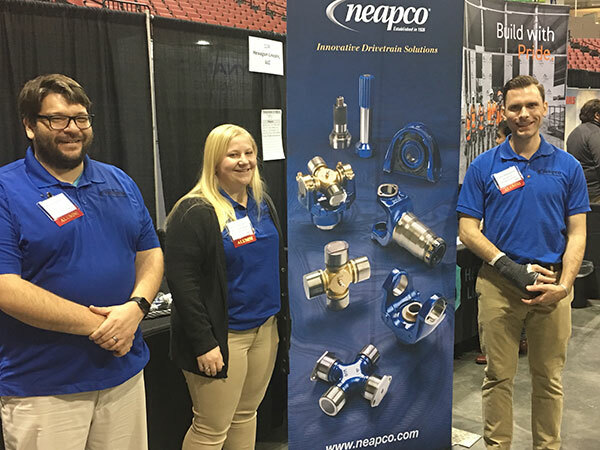 Amber Stettnichs and two of her colleagues from NEAPCO, a driveline technology company out of Beatrice, Nebraska, did just that spending Thursday, Feb. 15 meeting and interviewing engineering students geared toward making a positive first impression. It isn’t uncommon to see the faces of many former Nebraska students now on the other end of the conversation while representing their employer at Pinnacle Bank Arena. Stettnichs and her co-workers Jacob Greenburg and Cory Haumont are all College of Engineering alumni and used prior career fairs experiences to prepare them for interviewing students. A week prior to the STEM Career Fair at PBA, University Career Services hosted “Career-Chella,” an opportunity for UNL students to maximize their career fair experience by learning how to launch their careers through presentations, including how to research employers, appropriate dress for interviewing and how to begin and end conversations with employers. Despite competing with more than 120 other employers at the event, Stettnichs says companies like NEAPCO benefit from the career fair because it introduces students to new companies and, better yet, opens the door to once-in-a-lifetime career opportunities.